I have had Cafe Maude on my list of newer places to try for a while and finally had the opportunity to try it. Overall I was very pleased with the experience. We went on a Sunday evening and the place was filled with diners. The host was very accommodating. We had noticed a booth had opened up in the back and even though we were a party of two, he was able to accommodate our request to sit there. Service for that matter was also really good. Our server knew the menu very well and was able to make good recommendations. The restaurant in my opinion is one of the more successful attempts at what seems to be the latest dining trend the “neighborhood bistro”. A comfortable environment where you can get a decent glass of wine, a range of interesting entrees and you don’t need to spend a ton of money or get dressed up. Not really fine dining but not your neighborhood burger bar either. While I do enjoy this type of restaurant, I do wish that the twin cities could support a broader fine dining, non-steakhouse scene. Cafe Maude offers a great environment along with live entertainment a couple nights a week. They also serve breakfast, brunch and lunch and seemed family friendly. I noticed a stack of high chairs in the corner. The majority of the current dinner menu is on the heavier side (appropriate for winter), featuring a collection of wood grilled meats, a variety of interesting sides and a cheese menu(a personal favorite of mine). They also feature a collection of specials that looked intriguing. We decided to start with entrees, order a side dish and save room for dessert. I began with a glass of Louis Latour Pinot Noir. I ordered the Fennel crusted braised short ribs with roasted garlic baby red mashed potatoes and Hacker Pschorr battered onion rings. It was perfect comfort food on a cold night. Portions are not overwhelming in size and the short ribs were nicely done. I am not sure how the fennel was worked in but the ribs were flavorful. They do a nice twist on the mashed potatoes by cooking them on the griddle before serving creating a crust almost like hash browns would have. In my opinion the onion rings were the best part of this dish. They were lightly battered and not overcooked. I think that onion haters would even enjoy them. We also tried their Hamburger. We added grilled mushrooms and St. Andre Cheese. The burger had a wonderful smoky flavor to it. They have a wide selection of condiments you can add including a fried egg. We also chose the caramelized brussel sprouts. They were served with a fresh salad of apple and beets. If you like brussel sprouts I highly recommend this dish. For dessert we tried the chocolate pistachio torte with pistachio ice cream. I enjoyed this because it was not too rich and was perfect for the two of us to share. It came with a spearmint sauce drizzled on the plate along with crushed pistachios. The next time we go back I would like to try their chocolate and hazelnut fried raviolis. This seems like a unique dessert that I have yet to see anywhere on a menu. Overall Cafe Maude offers a nice dining experience. I would highly recommend making a reservation, though they do have a nice bar area and waiting area to hang out and have a drink before you are seated if you are feeling spontaneous. They also have a free parking lot next to the building and there was plenty of off street parking available. I’ll be going back for lunch next. We were in the neighborhood and knew that the Grand Café served brunch on the weekends so we decided to give it a try. My last trip to the Grand Café was not bad but it was not great either. Of the 4 entrees we tried one was amazing and the others were average. My assessment was that the service was so slow that the food sat out too long. For a pan seared duck breast this is not good thing. I am not one that enjoys rushing a meal, in fact I do really enjoy a break between courses to take a few breaths, sip some wine and enjoy the conversation. But service at this restaurant has been consistently slow both times I have been there. The wait staff was very nice and knowledgeable, just not all that efficient when it comes to empty wine glasses and getting the plates from the kitchen to the diners. The food for brunch this time was stellar. The Huevoes Rancheros were magnificent. 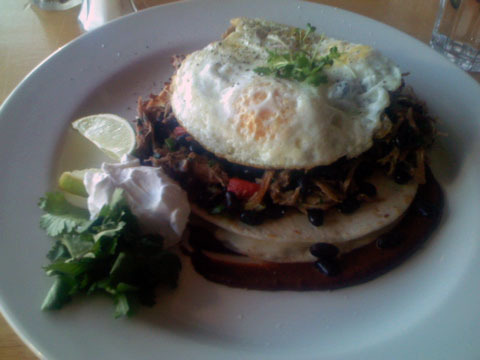 Their version is more French inspired and features Quesadillas filled with Berkshire Pork Confit, Oaxaca Cheese, Two Eggs Your Way (I had mine over easy), Mole, Black Beans, Cilantro, Sour Cream. Out of the kitchen the dish is actually fairly mild, the mole is nicely balanced and not too spicy. Mexican and southwestern food lovers might find this dish on the bland side. They bring you some condiments if you feel the need to add more heat. I was really impressed with the preparation and attention to detail. The dish was nicely layered and all the ingredients were fresh (except the pork) and high quality. I would highly recommend this if you go there for brunch. We also tried the steel cut oats. This is a dish that I would normally not order in a restaurant because after all it is oatmeal. This was not your run of the mill oatmeal. It came with a side of apples and Devonshire cream. Mixing these into the hot oatmeal was divine. I am excited to go back there again soon for dinner and brunch for that matter. I really like their dedication to high quality local ingredients. I am hoping the service will become more efficient as time goes on. I was really excited to try Stewart Woodman’s new restaurant Heidi’s this weekend. Hoping that I would have an amazing dining experience to report after my Dining for Sport Holiday hiatus. I am certain the food at Heidi’s is very good. Unfortunately even with a reservation we were not able to dine there. My assessment is that they are still working out the kinks in the system. The space is small and can’t handle many diners waiting for a table even with a reservation. We made the mistake of showing up 10 minutes early for our 8pm reservation. I knew we were in trouble when the Prada wearing host said to the couple next to us. “Your reservation was at 7:45 right?” He seated them a few minutes after 8:00 and was buying glasses of wine for the the other party of two who had been waiting even longer. At 8:15 he came back to us and said “I am going to create a space over here for you”. And he moved a table next to the coat rack and set up the place settings. The table was near the front door and every time it opened we froze. I was able to handle this since I was looking at the menu now. I had my eye on the fingerling potato salad and poached pheasant. At 8:25 our server came, gave us some water and told us about the special. He seemed frazzled. He said “I will be right back to take your order”. Then it really went downhill. At 8:30 a party of 6 entered, then a party of 4 and then another party of 2. We had the luxury of having all of them standing around our table waiting to be seated. Neither one of us thought that we would be giving an eating or dining etiquette demonstration so we got up and left at 8:35 (yes I went straight to jP’s). As we were walking out the door even more people were coming in. The menu is very reasonably priced. I also thought the wine selections were very nice and I am going to go out on a limb and say that the food is probably really good too. I could smell the truffles when I walked in the door. But 35 minutes past our reservation time and we only had water along with our table in the waiting area was not how I pictured my Saturday evening. I will make a return visit to Heidi’s but only on a Tuesday or Wednesday (they are not open on Mondays) and only when the hype dies down a bit. I was dining at my favorite Minneapolis restaurant and asked Andrew if he knew anyone that could cater an 80-100 person event at my office. Without hesitation he said “you should talk to Nina Wong, she does some really amazing Asian/Indian fusion. And oh by the way…I can run the bar.” I thought “wow” that is a fantastic idea. Nina and Andrew were an amazing team. Nina created a collection of 7 impressive passed hors d’oeuvres. Andew designed custom cocktails and paired wine and beer. Each item was skillfully prepared and reasonably easy to eat without silverware. My favorite in the group was the tuna. It was flavorful and fresh. Six actually made a nice dinner. The pumpkin cream cheese wontons were a nice touch of Fall comfort food and worked well with the Asian theme. I also enjoyed the California rolls. Along with the tuna they created a nice sushi experience. I highly recommend going to Nina’s Minneapolis restaurant Chindian Café. 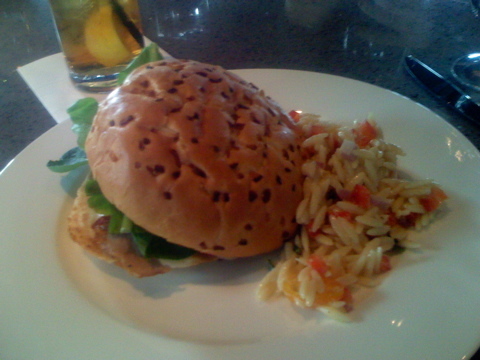 The food and the drinks were perfectly matched and a nice change from the standard catered fare. We had Andew pair a white and red wine along with a light and dark beer selection. The showstoppers were Andrew’s custom made cocktails. He did a variation on a gin and tonic complete with house made pickled fennel, cucumber and mango. He also created a Vodka drink with Apple cider, sour and some secret ingredients he would not disclose. You’ll have to go to jPs and ask him for one. This drink really surprised me because I don’t like vodka all that much. The initial idea of it with Apple Cider seemed like an odd combination. The end product was a light and refreshing drink with just a hint of fall. What impressed me most about Nina and her team was how smooth and tactical they were. Service was flawless and professional. Before the event she surveyed our space and made recommendations for tables, bar placement and traffic flow. All of the rental equipment was handled and they left our office in the same condition it was in when they got there. What was even more impressive was the fact that the servers were all really friendly and they made our guests feel at home. If you are looking to create an event I highly recommend the Nina + Andrew dynamic duo…. guaranteed success. I was looking forward to my visit to the Grand Café, knowing that the concept was similar to its former incarnation as Bakery on Grand. I was a big fan of their rustic, fresh, understated approach to both their menu and wine list. Grand Café is similar but different. We made a reservation at 7:15. When we arrived the place was busy. The restaurant itself is a nice, warm space. They have made some nice improvements, but kept the overall layout and approach. My first impression was that they were unorganized. It took us a while to find someone willing to help us get to our table. Not a single employee would acknowledge that we were obviously waiting to be seated. Finally the host showed up and brought us to our table after about 5 or so minutes. Like I said earlier. I thought the environment was really nice. They have thought about the details to make it a nice dining experience. The flatware, and plates are well thought and fit with their theme in an appropriate, not trying too hard way. It was way too dark for me to take any iPhone pictures. I have a new policy. 1. If I can’t get a good shot I won’t take one. 2. I will not ever use a flash in a fine dining restaurant. So no picutures this time it was too dark. We started with several first courses. The warm beet salad was excellent. It is a nice combination of pears, goat cheese, honey and walnuts. We also tried the Creamy Leek Tart. It was really good. I especially enjoyed the roasted tomato and poached egg that came along with it. This would be a wonderful brunch or breakfast dish. The leeks were not overpowering. I think diners who don’t care for onions would even enjoy this. Another star at the table was the trio of Canapés. They change regularly and offer a range of flavors. For entrees I went with the duck special. It was a pan-seared duck breast served with fingerling potatoes and braised greens. The duck was cold and not all that exciting. The potatoes were good. I think the dish would have been better if it would have been served to me sooner. Overall, it was not nearly as good as the Kobe Brisket. This was great comfort food. Don’t miss this one if you go. It was tender and flavorful served with beautiful porcini mushrooms and mashed potatoes. The pork loin chop was also good. Not stellar but good. I think this dish also suffered from sitting too long before it was served. I enjoyed the apple chutney with cranberry and rappini it came with. The last entrée we tried was a special containing trout. 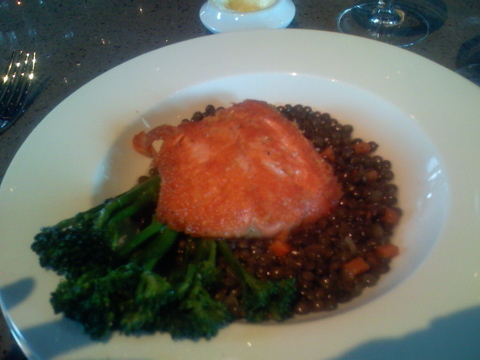 It closely resembled salmon so I stayed away (allergic to salmon). It was reported that it was OK, but would not order it again. Desserts were excellent. We tried the pumpkin cheesecake and the Bete Noire. I actually preferred the cheesecake. It was served as a round with the crust more like a cookie on top. The Bete Noir was a dense chocolate cake served with blackberries and citrus crème anglaise. It was just enough for a taste without being overwhelming. The wine list at Grand Café is appropriate. There are some nice selections and range in terms of variety and price. It is clear that they have taken time to carefully select wines that work well with the menu. Service was my biggest complaint along with the entrees. It was very slow. Our server was very nice, but we waited a really long time between courses and my entrée was served cold. I also had to point out to the server that we were not charged for the $50 bottle of Burgundy I ordered. Whoops. I would recommend ordering off the menu and staying away from the specials. Both dishes that came from the regular menu were good. I would not order the fish or the duck again. I recently had lunch at Cue at the Guthrie. Only having experienced dinner there, (when it first opened) I thought lunch would be fun. It was very clear to me that this restaurant is now really only intended for the theater crowd (even though they say they are not). In fact based on the number of tables that were occupied, (5 I believe) it surprises me that they are even open for lunch. If you are looking for a place to go and don’t want crowds but you are not overly concerned about being wowed by the food, Cue is a good place to go. I have heard mixed reviews overall about Cue in general. My dinner experience there months back was good. Lunch…not so much. What impressed me most about my dinner experience was that the food did not feel like it was “catered” or produced by room service. Lunch felt like something you would get at a conference or large scale catered event. There was a group of 5 of us. Most started with the soup of the day. It was a wild mushroom soup. The soup was not bad, just not anything really all that interesting. Not to knock Lund’s and Byerly’s (2 of my favorite places), but the soup at Cue was about equal to what you would get there in the deli. It seemed as though (I can’t be sure), it was frozen and reheated. For my entrée I had the pork sandwich. It was dry. That is all I am going to say. Nothing else needs to be said. I did enjoy the orzo pasta salad that it came with. This was for me the best part of this meal. Others had the salmon and reported it was fine. Seemed a bit over cooked to me, but I happened to be with my wife who ENJOYS OVER COOKED SALMON (that is for the person who recently left a very irritating comment on my blog). We all skipped dessert and went right to coffee. I think it would be really difficult for Cue at the Guthrie to attract a lunch crowd unless there was a matinee. It is too far from downtown to walk there and back during the lunch hour.The space if really nice and we were able to have a quiet lunch. Though it did feel weird at 1:15 when we were the only people in the restaurant. It will take a bit to get me back there for dinner. We arrived at the restaurant on time for our reservation. I heard the hostess tell the people in front of us (who did not have a reservation) that there was a 45 minute wait for a table. The place was packed with a lot of people waiting in the lobby for a table. If you go I would recommend trying to get in on Open Table first. With a reservation we were seated immediately. The restaurant is very nice inside. It feels a bit more upscale then El Meson does. The tables are fairly close together but not close enough to be irritating. My first impression of the menu was there were a lot of choices. The dishes seemed very complex. It was too dark to get readable photographs of anything so I skipped it. We started with 2 appetizers. Cafe Ena was featuring a carrot ginger soup … “sopa del Dia”. We also tried the Tamal. 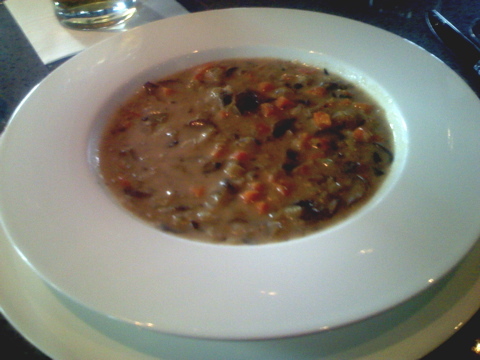 The soup was quite good, very flavorful and of perfect consistency. The cup sized portion was just enough. The Tamal, described on the menu as a traditional Oaxacan tamal filled with chicken in a dark mole sauce wrapped in a banana leaf garnished with Cojita cheese was OK. Though I thought the mole seemed a bit lifeless. The filling was in the same category. It was prepared well, it just seemed to lack energy and flavor. For entrees we tried the Atun which was a corriander-crusted ahi tuna served over serano mashed potatoes, grilled asparagus, in an orange bell pepper cream sauce, garnished with a green apple fennel slaw. I had a lot of problems with this dish. The tuna was seared rare. I love seared tuna. My problem with the dish was that the pieces were too thick. The outside was seared but the inside was ice cold. Way too cold. Thinner pieces seared rare would have been a much better experience. The cream sauce was boring and I could only taste apple in the slaw…the fennel seemed non-existent. The serano in the potatoes was tame and did not seem to add much value. Overall a pretty blah experience. We also tried the Cararon which was Procsciutto-wrapped jumbo shrimp served with red pepper mashed potatoes, sautéed artichokes, grilled asparagus, and peppers in a lemon caper butter sauce. I thought this one was better then the tuna but overall fairly average. In my opinion there was too much going on and the plate lacked focus. The shrimp and procsiutto were cooked well. We skipped dessert and went right for the check. Service was excellent at Café Ena. The server knew the menu and wine list well and was able to make good recommendations and pairings. Even though the restaurant was busy, we never waited a long time for anything. The wine selection is also really nice. I found the selections to be diverse, reasonably priced and worked well with the menu. I think Café Ena is a good neighborhood restaurant. I had much higher expectations based on the number of times I have eaten at El Meson. Looking at how crowded it was, I would assume that the majority of the diners lived nearby and it is a convenient location. I don’t think I would go out of my way to dine there. Though I would be really happy to have them near my house….since the closest restaurant to me happens to be a Perkins.